All of the applications are open and the candidates can apply for HEC Commonwealth Scholarship 2019 Pakistan. It is big and very popular scholarship. The Commonwealth Scholarship Pakistan is fully funded scholarship and the Commonwealth Masters scholarships are for the students from low and middle class income of the Commonwealth countries for the full time study in master degree programs at UK University. HEC Commonwealth Scholarship 2019 general masters & PhD scholarships UK, nominations have been made by HEC on for applications. The scholarship is offered in almost every program of PhD. The students, who are waiting for their result, they should not apply for it. For this scholarship program, IELTS / TOEFL or GRE is not required. IELTS will only be required if you gen mentioned and selected by the Commonwealth. HEC may conduct the test or interview or both in order to short list the candidates. According to the timeline, there will be no test but the interviews of the candidates will be conducted and the candidates can have more chances to get selected in this Commonwealth scholarship. Everyone can apply for the Masters and PhD and there is no requirement of the faculty member for it. There were over 80 Pakistani students, who were selected last year for the Commonwealth Scholarship Pakistan 2018 for Masters and PhD in UK under their scholarship scheme. The nominations are now opened by the HEC Commonwealth Scholarship 2019. Approved airfare from your home country to UK and return at the end of your award. The candidates should be Pakistani/AJ&K national & permanent residents of Pakistan/AJ&K. The age of the candidates must not be more than 30 years for Masters & 35 years for Ph.D. at time of submission of application. Be available to start your academic studies in the UK by the start of UK academic year in September/October 2019. For Master Scholarship, candidate must hold a first-class degree by the closing date of application completed in all aspects in graduate qualification (16 years degree i.e. MSc/MA/MBA/BS/BBA etc) in the relevant field of study. For Ph.D. Scholarship, candidate must hold a first-class degree complete in all aspects in postgraduate qualification by the closing date of application (17/18 years MS/MPhil degree) in the relevant field of study. The candidates must not have any third division throughout their academic career and maximum of two-second divisions are allowed but candidate must not have second division in the terminal/ last degree. The candidates must apply under one of themes as mentioned above and on CSC website and candidate’s field of study must be in line with future development needs of Pakistan. 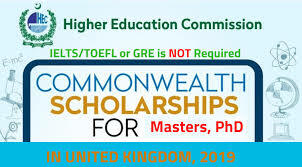 The candidates must not be registered for Ph.D., or MPhil leading to Ph.D., or Masters at UK University before September/October 2019 or candidate has not studied at the same level in the UK before. The candidates be financially unable to afford study in the United Kingdom without this scholarship. The candidates can apply online at HEC website: http://eportal.hec.gov.pk/loa. After registering and filling their profile, please select “Learning Opportunities Abroad” under “Scholarship and Grant” menu, provided in the left-hand side panel of online portal. After that, apply online to Commonwealth Scholarship through Electronic Application System (EAS). The candidates should attach deposit slip of Rs.500/– (in original) deposited through HEC online Account No. 17427900133401 in HBL, Shalimar Recording Company Branch, H-9, Islamabad. All payments will be made to HEC through HBL online facility. This facility is available in all branches of Habib Bank Ltd.
All the applications for the Masters / Ph.D. program without submitting both EAS Application form and online HEC form, will not be entertained. Commonwealth scholarship forms will be provided to shortlisted candidates only. 1. HEC may conduct test/interview or both to shortlist candidates. 2. Commonwealth UK does not accept direct applications and all of the nominations from Pakistan will be routed through HEC. 3. HEC endorses equal opportunity; therefore, females are encouraged to apply. 4. HEC will shortlist eligible applicants based on selection criteria i.e. highest academic merit, quality of study/research plan and relevancy of selected field of candidates with future development needs of Pakistan, provincial/regional quota and number of scholarship slots allocated for Pakistani students. 5. The applications received by-hand, incomplete or applications received after deadline will NOT be entertained. The recommendation of nominating agency i.e. HEC will be final and binding. 6. Please note that HEC has facilitation role in nomination process and final selection will be made by donor country. Further, HEC will have no financial liability regarding this scholarship. 7. In case of submission of false information at any stage, HEC reserves the rights to cancel and debar for all future scholarships and impose penalty, as decided by HEC.